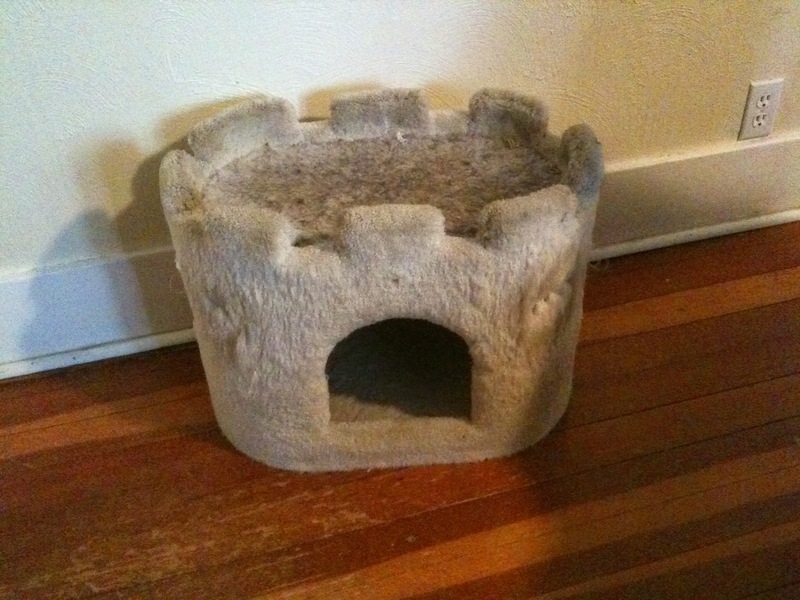 This cat castle has clearly seen better days: It's scratched bare in places, the layer of fleecy material on the top is loose in one corner, and it's covered in fur. But this is a different sort of post than the other two, because I'm not sure if we're getting rid of it yet. I bought this for my cat Cleo back in 2005, when she was recovering from fatty liver disease. She was sectioned off in a room by herself, and I wanted to make her feel more at home, since her favorite cat tower was in a different area of the house. She has slept on top of the castle on and off ever since, but since she got sick again last year (this time with a nerve problem that has left one side of her face paralyzed), she hasn't been using it. One of the ways to determine whether you need to get rid of something is to pack it up, pretend like you no longer have it, and see if you miss it. We're doing almost the exact opposite to determine if we should get rid of the cat castle: We've relocated it to someplace we think Cleo might be able to use it (near her "home base" in the kitchen, where she stays most of the time because it's close to the food, water, and litter box), and if that doesn't work we'll get rid of it. We can always get a new one (and probably should anyway) if she recovers enough to become comfortable in the entire house again. I'll post an update once we decide what we're going to do -- if we do get rid of the cat castle, most likely we will Freecycle it or drop it off at Goodwill. I had a very busy day yesterday, so I missed posting -- yesterday was actually Day 3. I still owe something for today, so I'm going to go look for something else to get rid of now!